parra assuntos sobre o Movimento LMS. Grato e desejo que tenhas um bom final de semana!! The third day began with more inspirational greetings and prayers from the sisters from Indonesia, from Pedro and Patty from the Fr. Joseph Marchetti Nucleus, Rowena Ranocco from Maryland, USA, Sandeep George from India, the Canada and Mexico nuclei, Mother Alda Monica Malvessi, Sister Lina Guzzo, priests from theDiocese of Houma Thibodaux in Louisiana, Dr. Alcazar Director of Urban Partners for the Twomey Center for Peace through Justice. The morning session covered mostly a discussion on the importance of formation and directives; and adapting them with the needs and reality of the specific nucleus, while putting the General Directives of the LSM over the governing staeyCenter for Peace te’s law. After a short break, the reporting of the nuclei ensued. The USA Nucleus reported, also in behalf of Mexico and Canada, the difficulties in formation, expansion and consolidation. Then the Philippine Nucleus reported having been able to develop 8 batches and at the same time having problems with maintaining that membership and keeping them committed. There were also questions regarding the formation materials used in the formation of the members. They placed importance on apostolate and social services, such as medical and dental missions; however they expressed great lack in funds. The Singapore report clarified their position as highly believing in the Scalabrinian Spirituality, however exceedingly lacking in formation and consolidation. The report from India was sent and presented in the Encounter. It presented some of their responses to the needs of the migrant community, such as prison ministry, legal assistance, etc. It was also reported that the group was facing the lack of vibrancy in their mission. However they expressed the need for a visible presence of the LSM. The afternoon session covered the workshop on the 4th General Assembly, which was presented by Giuseppe Morsia. This workshop clarified the general expectation for formation, expansion and visibility in the neediest migrant communities. 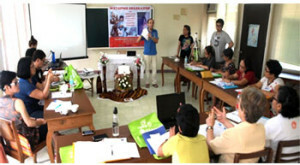 This was followed by the Our lady of Fatima 2010-2013 Trienial Report, highlighting on the following matters: setting up regional advisers and the separation of the North America and Asia group; focusing on expansion and reorganization of LSMM; representing Fatima group as official delegates to 4th LSM General Assembly; collaboration of LSM in the mission; LSM membership campaign and networking. It also presented the difficulties encountered and perspectives the group is looking forward to impart with the delegates. This day concluded with a special Eucharistic Mass celebrated Fr. Aladdin Luzon, osa at the Sto. Niño Shrine, Cebu City. The special intentions of the LSM group were also offered in the mass. 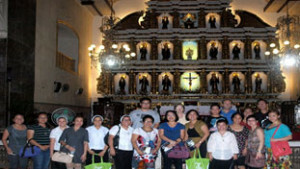 There was also a short Cebu City religious tour. Mission Expansion – Evangline Liclican, Sandeep George, Singapore Rep.
Congratulations to the newly elected officers! Having in mind the realities of Group and of the final document of the fourth lsm general Assembly the group continue to the planning for the triennial.